Xherdan Shaqiri was not brought in to be Liverpool’s Philippe Coutinho replacement, but the numbers show he might just be filling that void. Since Coutinho departed to Barcelona almost a year ago, the Reds have hardly struggled for goals, while Shaqiri has proven to be the bargain of the summer, costing just £13 million from relegated Stoke City. In the 2018-19 season so far, Coutinho has struggled in Spain, with Shaqiri absolutely flying in the Premier League. 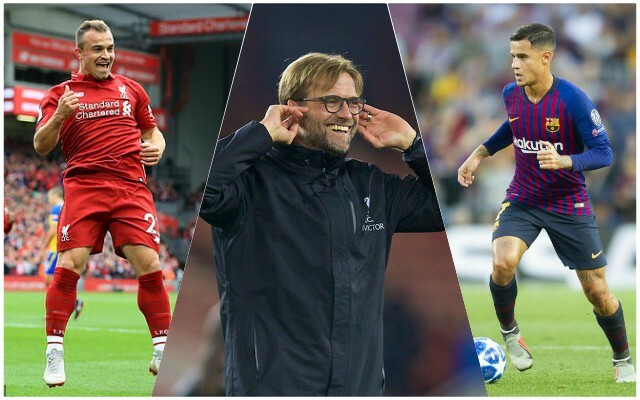 According to transfermarkt.com, Coutinho has played 15 La Liga matches compared to Shaqiri’s 14, but has played 925 minutes of league football compared to the Swiss’s 716. Despite that, Coutinho has just four goals – two less than Shaqiri. He also has one assist – one less than the Reds’ number 23 has provided. Per minute, Shaqiri is much more productive at the moment for Liverpool than Coutinho is for Barcelona. Coutinho was a great player for Liverpool, and is still a top player in Catalonia, but we have shown that we are brilliant without him being part of the attack. The funds generated from selling him also were spent on signing Virgil van Dijk, so it was a good deal all in all! It certainly makes for interesting reading to compare the stats of the pair of talented attackers this season – with Shaqiri coming out on top. His contributions will continue to be vital in the race for the Premier League title – we’re sure there are plenty more memorable moments to come from him.